A wolf den may be a set of holes dug in the ground, a rock cave, a space under a tree stump or in a hollow log or even a shallow pit. Pups can endure cold temperatures no matter what type of den they`re born in, but more structured dens provide protection from weather and predators. For reasons of territory, food supply and pup survival, wolf denning is all about location. Download full article. The wolf looms large in the stories of many Native American tribes, where it appears as a hunter respected for its intelligence, prowess, fierceness and strength. The author provides examples of tales that cast the wolf not as treacherous or immoral, as in many European narratives, but as another hunter— even another tribe or nation—with characteristics and abilities the Native peoples admire. The fact that wolves watch and learn from each other is no surprise to those who study them; social attentiveness in wolves is often observed and documented in captivity. Researchers have proposed that the cooperative partnership displayed by domestic dogs to humans is not the result of selective breeding during domestication, but merely retention of inherent, wolf social behavior. When people think of Yellowstone National Park, iconic images of geysers, breathtaking landscapes and plentiful wildlife often come to mind. That’s what most people remember from their family trips to America’s first national park. But for Kirsty Peake of Dartmoor, England, days spent in Yellowstone’s northern range each winter involve searching for wolves on a frozen landscape from behind a spotting scope in blowing winds and sub-zero temperatures. Last month several members of our board and I had the privilege of spending a few days in Yellowstone with Kirsty and her husband, Alan. To you who supported our wolfcare fundraising efforts in 2015 we want to express our heartfelt gratitude. If you bought a canoe raffle ticket, bid on an online auction item, supported us on Crowd Rise, selected a wolf-care donation card at the Wolf Den store, added an extra donation to your online shopping cart or sent a card with thoughts of our ambassador pack, your thoughtful gifts have made a difference in the lives of our ambassador wolves. The ten-hour drive to Ely, Minnesota and back doesn’t deter megamember Dana Pond from visiting the International Wolf Center. Since 2004, Dana has been going to Ely from the Chicago area twice each year to learn about wolves, assist the Center wolf-care staff and eventually, to serve as a pupcare volunteer. I have spent nearly half my life in the French Alps, where I work as a shepherd. In this beautiful, remote place, the nearest road and closest neighbours are an hour’s walk away. The pace of life is slow. In the nine years that I wandered the mountains with my flock, our biggest challenges were to have enough food to eat and to survive the harsh winters. But change was coming to those mountains. At first we saw new behaviour among the sheep, as they sometimes stopped and huddled together. The dogs began to hide by our feet or go into guarding mode, circling the sheep with hackles raised. Then we found dead animals with carcasses stripped clean. At first feral dogs were blamed, and we took turns guarding the sheep day and night. 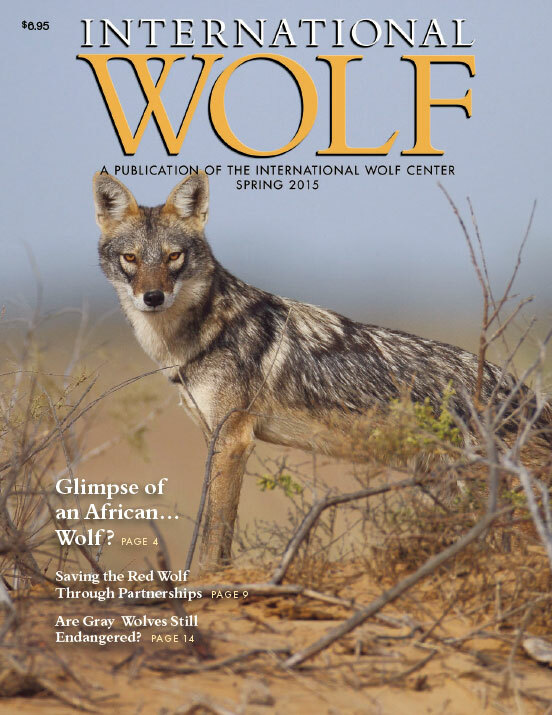 In spring 2013 International Wolf magazine ran my story about a mystery surrounding two wolves in the Superior National Forest Malberg Pack located in Minnesota’s Boundary Waters Canoe Area Wilderness. As part of a U.S. Geological Survey (USGS) long-term wolf study, we captured male wolf 7153 and female wolf 7159, likely brother and sister, as pups during the fall of 2010. But surprisingly, during winter 2011–12, when these wolves were yearlings, their radio collars were both on “mortality mode,” indicating their collars had not moved in more than four hours within two weeks of one another. When we searched their “mortality” sites, all we found were two heavily-chewed collars. My supervisor, Dave Mech, surmised that packmates may have chewed the collars off, and that 7153 and 7159 just might remain alive. The “old man” of our retired pack is Grizzer. He is 12 years old, which is old for a wolf, and he was born on May 5, 2004. Grizzer is a Great Plains subspecies of the gray wolf. For centuries, shepherds have been at loggerheads with the wild wolves that want to eat their sheep. To protect their flocks, they’ve turned to everything from bullets and big dogs to poison and electric fencing. But what if they could endow their sheep with a predator defense system and avoid harming wolves in the process?